On this page you will find a link to a professionally designed template that can be used to create an interview winning CV or resume. All you need to do is simply enter your personal details into the ready made text boxes and within minutes you will have an eye catching, interview winning and professional resume. The templates can be edited in any version of Microsoft Word. 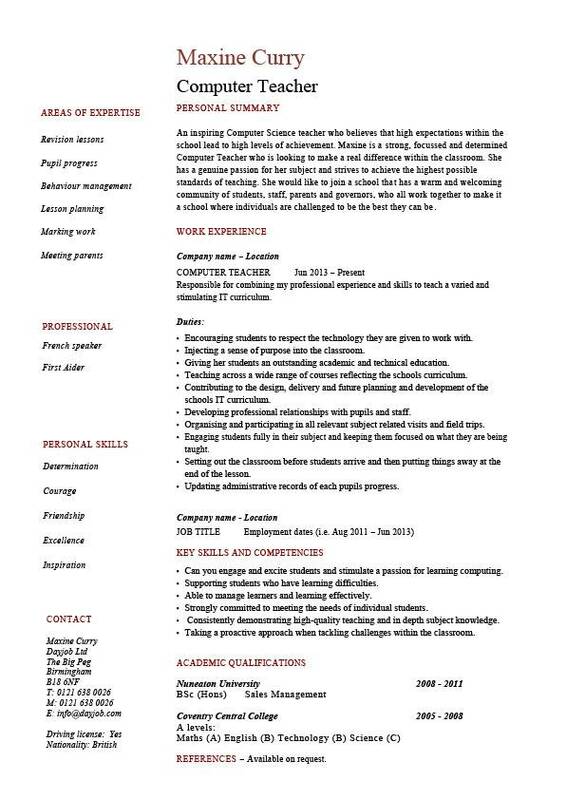 An energetic and versatile tutor who is able to teach across a wide range of Computer and IT topics. Karen comes to you with a strong background in planning lessons, organising extra-curricular activities and helping to transform the lives of her pupils. She is someone who possess a variety of competencies that set her apart from other candidates, chief amongst these is her ability to not only get students to listen, but to also understand. As a seasoned professional she can turn best practices into high quality, goal-driven results. Aside from her technical competencies, her pleasant manner and excellent communication skills allow her to quickly connect with children from all social backgrounds. At the moment she is looking for a suitable position with a school that has a culture that appreciates and rewards excellence. Responsible for teaching a computer curriculum that is consistent with the schools district goals and objectives. Teaching all areas of the school computer curriculum. Teaching students the latest computer skills. Creating rigorous lessons that are aligned with the subject curriculum. Providing ongoing and timely feedback to students on their progress. Involving parents and carers in a child’s education. Completing daily pupil attendance reports. Preparing assignments, course material and lessons for pupils to do. Marking and grading a pupil’s class and home work. Demonstrating computer hardware and software to students. Encouraging classroom discussions between pupil’s. Informing parents of a student’s academic progress. Installing teaching software on computers. Selecting which teaching resources to use in class. Enforcing high standards of student behaviour. Working closely with other teaching and school staff. Researching new subject topic areas to teach. Proficient in Windows and Microsoft Office software. Conducting frequent and appropriate assessments of a student’s abilities. Creating a culture of achievement within the classroom. Motivating and encouraging students to do better and achieve more. Knowledge of mainframe computers, networking technology and programming languages. A critical thinker and problem solver who when required to takes the initiative.